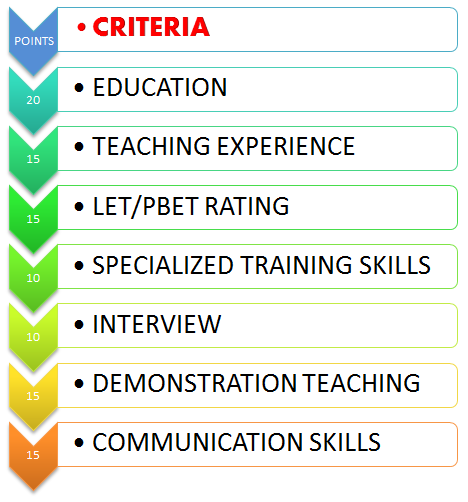 Home DEPED K-12 DepEd - Pointing System Guidelines for Teacher I Positions. - The GWA or the General Weighted Average of Applicant’s Academic Achievements. (TVET), learning institutions offering culture-based education programs for indigenous peoples (IP) - even prior to passing the LET - shall be given 1.50 points for every school year but shall not exceed twelve (12) points. For every month of service, 0.15 point shall be given. accredited or -recognized. Certificate/s of employment shall be used to determine validity of teaching experience. Specialized training for skills development in fields related to the work, duties, and functions of the Teacher I position to be filled shall be given a maximum of 10 points. (Teaching Ability, Classroom Management, School Fit) shall be added and then divided by fifteen (15). The quotient shall then be multiplied by 0.10 or 10%. The product shall then be multiplied by 100. The number of points attained for each of the fifteen (15) listed components shall be added and then divided by sixty (60). The quotient shall then be multiplied by 0.15 or 15%. The product shall then be multiplied by 100. National Education Testing and Research Center (NETRC). The respective Division Testing Coordinators shall coordinate with NETRC regarding the conduct and schedule of the exam in their division, which should be within February to March. The cut-off score for inclusion in the RQA is seventy (70) points. The RQA should 1) be published in order of highest to lowest scores of the applicants, 2) show both the results of each criterion and the final overall rating, 3) only include those who obtained total scores of seventy (70) and above, 4) indicate the date of posting, and 5) be signed by the SDS. Deped Order No. 002, s. 2019 - School Year 2018-2019 K to 12 End of School Year Rites. Thank you for visiting apttrendingph.com. If you have any other recommendation to make this site more fruitful and accurate in promoting and giving news about the Philippines, you are more welcome to write down your comments, suggestion and feedbacks below. You may also share this post if this to be helpful others. :) MABUHAY ANG PILIPINAS. hi po..typo po yong LET rating na 84-46 nakalagay..
We are an educational animated series that teaches common core standards through our animations, as well as accompanying activities and assessments that can be downloaded for teachers to gauge a student’s understanding and retention.